Leave it to Bob Dylan to follow three of the most pioneering electric-based albums in history by again deviating from the norm and straying from expectation. Hinting at a return to his folk roots and firmly pointing toward the field that became country rock,John Wesley Harding breathes with relief and freshness, the sound of an artist re-engaging with the past, forging a future, and stepping into new realms after recovering from an motorbike crash and unimaginable pressure. Mastered on Mobile Fidelity’s world-renowned mastering system and pressed at RTI, this restored 45RPM analog version presents the 1967 album with the finite details and impressionistic tones. Immediately notable for the slimmed-down instrumentation, brisk flow, and simple approach, the record continues to endure via a rustic, era-defying naturalism tied to the organic sounds and warm production swathing Dylan’s acoustic guitar, mellow voice, breezy harmonica, and minor accompaniments. All of these traits translate with incredible realism and lifelike air on this reissue, which also brings out the low end of Charlie McCoy’s bass with a previously unheard supple character. Wider grooves mean more information reaches your ears. 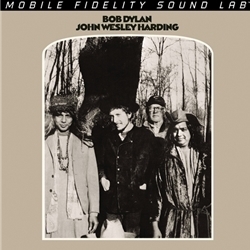 Recorded around the same time as the sessions that yielded The Basement Tapes, John Wesley Harding came together after just three studio sessions and approximately 12 hours of time. While many specifics are shrouded in mystery, a majority of songs are tied to Biblical figures, ominous matters, and morality themes. Making not just a clear sonic break from his most recent efforts, but a songwriting transformation as well, Dylan embraces a strict economy of scale, dropping beat-poetry techniques in favor of stanzas that waste no words and progress narratives at every turn. It’s as if the Bard is saying that truth is spoken here. Few, if any artists, have captured the American myth and its population of immigrants, drifters, and outlaws with such convincing scope and parabolic sagacity. Climbing to number two on the Billboard charts and quickly tallying one million in sales, the pared-down work resonated with a public ensnared by its myriad charms. Then, of course, there’s the utter brilliance of every one of the songs here, each seemingly occupying a timeless space that suggests they could’ve been made in 1967, 1937, or 2007. With “All Along the Watchtower,” Dylan landed upon a tune that would soon become one of the most-covered and revered tracks in history. And yet it isn’t even a standout on an album on which every note just belongs.